I asked Cardinal Schonborn to give us his opinion on Medjugorje. He thought for a few seconds and said: I have been part of the Committee of experts who has studied this religious phenomena. Our conclusions are already given by the Congregation for the Doctrine of the Faith, of which I am a member. But something significant is that Pope Francis, before the Congregation was defined on the subject, asked to be handed the study prepared by the Commission. That is, the Pope is very interested in everything related to Medjugorje. He also stated that some members of the Commission were suspicious that the Virgin Mary appeared every day for so long. He answered them: For St. Faustina appeared to the Lord sometimes several times a day and is approved by the Church and she canonized. 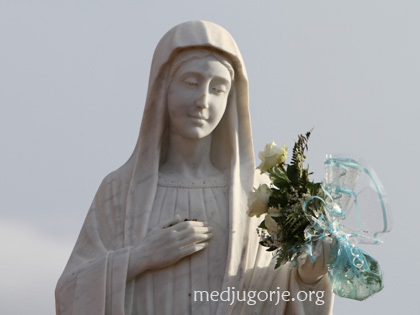 He is aware of the good that is being done in Medjugorje and in any part of the world that invokes Mary Queen of Peace. He organizes periodic prayer meetings with young people in his cathedral, and often invites one of the “seers” to talk to the children about their spiritual experiences and what they receive from the Virgin. When I asked him about the future of Medjugorje he told me that there is one thing clear: the Church is not going to “break” anything that has been built for years. That is, Medjugorje will continue to captivate the world. Next post: What Pope’s Envoy concluded in Medjugorje?